Crocosmia is a stunning plant that adds striking shape and a splash of hot colour to the garden. It has sword-shaped leaves and funnel-like flowers on stems that can reach 2 feet tall. The plant comes in a range of sunset colours from bright yellow to fiery red. The plant originated in South Africa and all the varieties we have are bred from South African species. Despite this, most of them are hardy, reliably coming back year after year. Crocosmia takes its name from ‘krokos’, the Greek for saffron and ‘osme’ meaning smell. This is because the flowers smell of saffron, a feature that is increased by steeping them in water. The plant was also once used to make is a yellow dye. The plants bloom from July to October, depending on the variety. Flowers are usually bright orange, red or yellow. Their hot colours and striking foliage make them a great addition to a tropical style garden and they can add a note of the exotic to many planting schemes. They also make an excellent cut flower for indoor arrangements. The leaves are a striking sword shape, sometimes pleated, and are an attractive architectural addition to the garden even before plants bloom. Crocosmia are grown from corms and are a member of the Iris family. They are easy to grow and can be planted in borders or in containers. The plants grow from 2-3 feet (½-1 metre) each season and die back over winter to return the following spring. There are dozens of varieties available and they differ in height, flowering time and colour but also hardiness, so do check the variety before you buy. Several forms are naturalised in Britain and great swathes of them can be found on the Cornish coast and the lanes of Southern Ireland in late summer and the beginning of autumn. 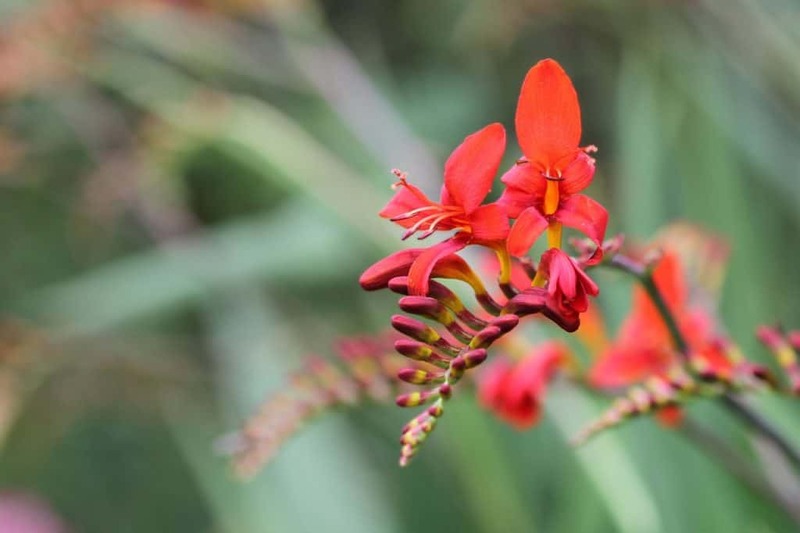 This article will show you how to choose and grow crocosmia and how to take care of these sunny additions to the garden. Most crocosmias are hardy. However, a few varieties are not. After a severe winter, these may be slow to regrow or not reappear at all. If you live in a very cold area, stick to the tried and tested hardy varieties. Crocosmia are grown from corms and can be propagated by division. Crocosmia come in a range of varieties. They all bloom in shades of red, yellow, orange, though some age to peachier tones. Some varieties are a blend of colours. Many varieties are fully hardy so you can plant and leave them in the borders over winter. However, a few varieties, often the darker leaved types, are not fully hardy so check this if your garden is particularly exposed. Some varieties reach heights of 3 feet (1 metre) and take up a lot of space. One of the most popular varieties, Crocosmia Lucifer grows up to a metre. However, many other varieties are smaller and are suitable for the middle of the border. You do need to select the variety carefully to make sure it is the correct height for its chosen site. In a smaller garden, choose shorter and more compact varieties such as C. Norwich Canary or Jackanapes. The compact C. ‘Emily McKenzie’ is another small variety that is particularly attractive, having flowers that are bright orange with a deep red throat. This RHS Award of Garden Merit winner has soft orange flowers that age to a pinky-peach. It reaches a height of ½ -1 metre (20-40 inches) over the course of the season. It flowers from August to October providing a late boost of colour to the garden. The flowers look particularly stunning in soft autumn sunshine. ‘Carmine Brilliant’ has soft red flowers that are paler inside. This is a good all-rounder as it tolerates most conditions and will even flower in exposed sites or partial shade. It grows to around 60cms (23 inches) and flowers from July onwards. Jackanapes flowers are an attractive mix of red, orange and yellow. It is a less hardy variety so will benefit from a sheltered spot and/or a winter mulch. It is one of the smaller varieties reaching a maximum height of 60cm (23 inches). This variety produces numerous short stems bearing orange buds and canary yellow flowers. It blooms from mid-summer to early autumn. It has attractive pleated leaves and grows to a height of 60cm (23 inches). This variety was the first truly red crocosmia and was bred by Alan Bloom in the 1960s. Lucifer is a striking and one of the tallest, so it needs plenty of room to grow. The stems rise above the leaves to a metre in height and are topped with devilish red flower sprays. It generally does not need staking despite its height. The pleated foliage is very attractive, and it flowers from mid-July right through to September. ‘Rowallane Yellow’ has narrow sword-shaped leaves and sprays of golden yellow flowers that are wider than many varieties. It can be slower to increase than some, which makes it good for a smaller garden where more vigorous varieties could become invasive. It will not flower well unless it gets a good amount of sun. It reaches a height of 80cm (30 inches). Most crocosmias are easy to grow and can tolerate most soils. To flower at their best most will benefit from full sun and a humus rich soil. As these plants are native to South Africa they do best in full sun. If planted in shade they may put on attractive foliage but fail to flower well, if at all. There are some varieties, such as C. ‘Carmine Brilliant’ that will do well in semi-shade. Crocosmia is drought tolerant and only really needs watering in exceptionally dry weather. However, the leaves can sometimes become brown if the plant is dry for a long period. In their native South Africa, they are used to hot and dry weather but with periods of summer rain. For this reason, a good summer deluge suits them, and they often flower more prolifically in the weeks and months after a wet spell. Your crocosmia will tolerate any soil as long as it is reasonably nutrient rich. They flower reliably even in heavy clay. However, they do prefer a more well-drained soil, so it’s worth adding some sand or grit to heavy soils to improve drainage and reduce the risk of rotting or disease. Crocosmia will only need fertilising if the soil is poor. Apply a general all-purpose fertiliser when shoot begin to show in spring. They can benefit from a mulch over winter, especially the less hardy varieties. Container grown varieties will require a general-purpose fertiliser at the beginning of the growing season. Plant in a sunny site and they will soon form a clump that produces attractive spikes of leaves and tall flower stems topped with sprays of flowers. The better the position the more abundant and larger your plant will be. In less ideal conditions they will still do well but may flower less well in heavy soils and when planted in shade. Crocosmia is a perennial which means it flowers every year and dies back over the winter disappearing completely until new shoots begin to appear once more in spring. The plants grow from corms, which are similar to bulbs. These can be bought dry or already planted in pots. Crocosmia look most natural if they are planted in clumps. Planting the corms is similar to planting bulbs. The corm contains all the nutrients for the plant to sprout when the soil begins to warm. The corms should be planted in spring. Add some well-rotted manure or soil improver if the soil is poor. You can also add grit or sand if the soil is heavy and sticky. Position the corms around 4 to 8 inches (10-20 cms) apart, depending on the size of the variety when mature. They should be planted 3 to 5 inches (7-12 cms) deep with the pointy end up. The corms will produce offsets and spread over time. If the soil is dry when you plant them water the corms in. They will need to rehydrate before they can begin to grow. Keep the soil moist but do not overwater as this can result in the corms rotting. If you buy your crocosmia in pots they will often establish more quickly as they have already had a chance to rehydrate. When growing in containers, select a large pot with plenty of drainage holes. Keep the pot moist, but not waterlogged. Apply an all-purpose fertilizer sparingly for good flower production. Once planted, crocosmia needs little care and attention. They will benefit from watering when the weather is very dry. They are hardy and do not need to be lifted in winter like more tender plants such as dahlias. They may benefit from a mulch over winter to protect the corms, especially if your garden is in a cold area or they are planted in a very exposed site. Most varieties are very hardy, though. Some varieties are vigorous and can even be a little invasive, so pull up any that have spread to unwanted areas. In autumn, when flowering is over, leave the plants until they have begun to die back. Once this happens the foliage can be cut back to ground level. If you want to cut some flowers for indoors you should choose stems where the lower blooms have just begun to open. They will continue to open indoors. When you first cut the stems place them in a vase of water at 100℉ (37.8℃). Put the vase in a dark place for 48 before using them in your display. This will help the blooms stay fresh for longer. Crocosmia blends in well with a variety of planting schemes from informal cottage-type gardens to sculptural styles and tropical themes. Late-flowering shorter orange varieties look great with asters, which also enjoy a sunny site. Other choices include heleniums or late flowering aconitums. The taller varieties, such as Lucifer, look good planted in swathes interwoven with grasses. Lucifer also contrasts well with deep blue plants such as Nepeta (Catmint) or blue and purple sages. Later-flowering, fiery varieties can be woven up through purple dahlias to make a vibrant contrast. In a hot-coloured bed, choose other sunset colours such as the bright red Dahlia ‘Grenadier’ and the bright orange Canna ‘Wyoming’. Of course, different varieties of crocosmia also look good together. Try pairing the statuesque Lucifer with the dainty ‘Emily McKenzie’ or the bright yellow of Norwich Canary. As your clump of crocosmia will spread, you can propagate them by lifting and cutting apart sections of the grouped corms. It is not necessary to divide the plants for health reasons because the new corms from above last years to produce a vertical chain of corms. As the old corms rot they feed the new corms meaning the plant stays vigorous. However, the plants can sometimes benefit from dividing if the space allocated becomes overcrowded and the soil depleted. Replant your divided corms in their new situation with an addition of soil improver or well-rotted manure if the soil is poor or depleted. Opinion is a little divided about the best time to divide the plants. Some gardeners advocate spring, while others say doing this is autumn is best to avoid damaging new shoots. Your plant should do well either way. Crocosmia can also be grown from seed. Plant seeds in seed trays, about ½ cm (¼ inch) deep, in seed compost in a greenhouse or indoors. Transplant the seedling in late spring when the soil has warmed up to about 10°C (50°F). Crocosmia are usually healthy and untroubled by pests. Most problems are caused by less than ideal growing conditions. These plants are troubled by few pests. Even slugs and snails won’t touch them. Occasionally they may be affected by spider mites or thrips. In both cases, you can knock the pests off with a strong jet of water. Use an insecticidal soap if the infestation is severe. These pests should not cause any long-term damage to your plants. Crocosmia are usually healthy and disease-free plants. However, they are susceptible to a couple of diseases which are discussed below. As the name suggests this disease most commonly affects gladioli. However, crocosmia can occasionally succumb to the disease. Symptoms include blackish-brown or brownish-yellow spores that appear mostly on your plants leaves. Gladiolus rust is usually caused by high humidity. To protect your plant, water at ground level to keep the leaves dry. It is also best to water early in the day so that the moisture has a chance to evaporate from the foliage. If your plants have been affected in the past you could apply a fungicide such as sulphur powder or copper spray early in the spring as a preventative measure. Once the symptoms have appeared these treatments are less effective. However, your plant is unlikely to suffer any long-term damage even if affected by this disease and will usually reappear the following spring. A more serious threat to your crocosmia is Bulb/rhizome rot. This is a bacterial disease that occurs in warm humid weather, particularly in bulbs that are planted in poorly drained soil. Symptoms can include stunted growth, yellowing leaves or a complete failure to emerge in spring. Prevention is better than cure with this disease. Improve drainage by adding grit or sand. In addition, ensure you only buy healthy corms that are not cut, scraped or bruised as this allow the bacteria to get in. Again, water the plant at ground level, preferably in the morning. Q My crocosmia has plenty of leaves but has very few flowers. Those it does have are tiny and spindly. What is wrong? Most crocosmia like to be in full sun. Unless you have chosen a variety that can tolerate part shade this is the most likely cause of the problem. Try dividing you plant and moving some to a sunnier site to see if this makes them flower. If the weather has been particularly dry this can also affect flowering. If you have already recently divided them, they can take a while to re-establish themselves. Hopefully, they will do better next year. Q My crocosmia has failed to reappear this spring. What could have happened to it? Most crocosmia are hardy but there are a few varieties that can be affected by very harsh winters. It is possible that your plant has succumbed to the cold weather. It may have died, or it may just have been delayed. A second possible reason is that your corms have been infected with bulb/rhizome rot. 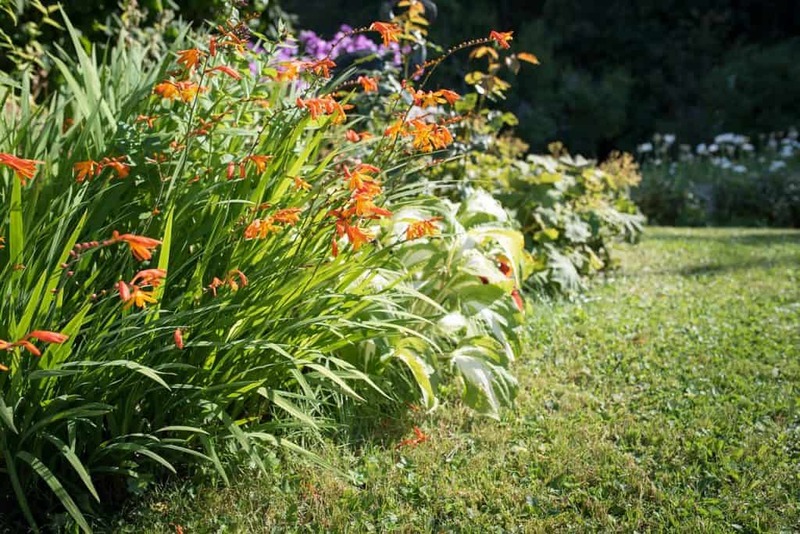 If you plan on replacing your crocosmia, choose a hardy variety, plant in full sun in well-drained soil and you should enjoy a reliable plant that come back year after year. Q My crocosmia’s leaves have all turned yellow. What can I do to bring it back to health? It is possible that you are overwatering your crocosmia. In their native South Africa, they are used to dry conditions with the occasional summer deluge. Too much watering can wash nutrients from the soil and cause the corms to stay wet and eventually rot. I would make sure your plant gets a chance to dry out a little more between waterings.